Skin contains a dark pigment known as melanin. Patchy or uneven pigmentation occurs due to overproduction of this pigment. Pigmentation on the face comes in many shapes and forms; the main cause for this is skin trauma of some kind, along with hormonal & hereditary issues. Lasers are used very judiciously to treat pigmentation. It is necessary to assess the cause, the type and depth of Skin Pigmentation. Majority patients present with pigmentation at various depths of the skin and at times we are faced with dealing with a patchy skin i.e. light and dark areas in a mottled distribution. Lasers used to treat pigmentation like the Q Switched are not always indicated to be used alone. This is because they can cause a persistent and bad rebound pigmentation. We need to initially use Detoxifying lasers to neutralise the photo damage effects and at times we need non ablative fractional lasers especially in patchy skin tones. Q-Switched lasers need to be used carefully in certain areas of the face because of their reflection through blood which may increase target areas and a lateral spread giving undesirable effect. 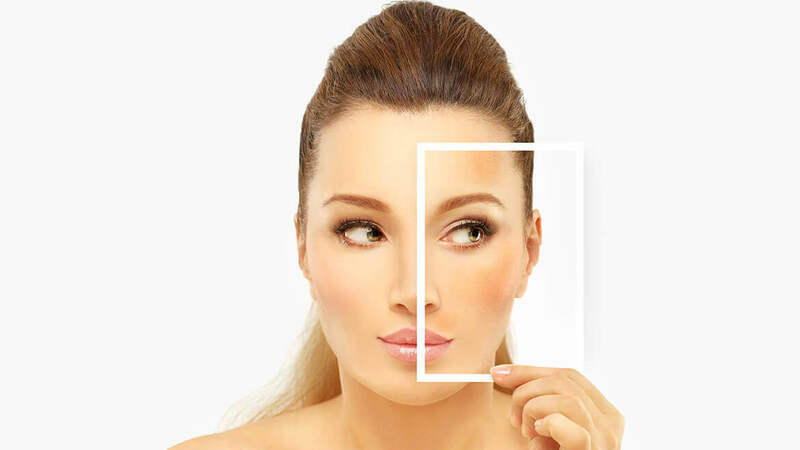 Treatment of Pigmentation with lasers is as complex as the causes of pigmentation and various modalities like mesotherapy, oral supplements, and superficial peels. In home protocols are combined with very strict sun protection. Laser photo facial using different lasers which target pigments also improving the quality and texture of the skin through subtle heating of dermal layers. This dilutes pigment, stimulates collagen regeneration and refines the skin texture. Use of concomitant Carbon lotions causes Photo-acoustic effect which enables gentle exfoliation of the skin enhancing penetration of Laser. Over courses of treatment, unwanted pigments are suppressed and lightened – creating an even and brighter skin tone. The increased collagen in the skin quantitatively helps to lighten the skin tone due to light diffusion. It cleanses pores, reduces pore size, improves fine lines, acne marks, and reduces redness, leaving the skin luminous. The chemical peel is an application of specific pigment lightening or collagen stimulating chemical preparations. Modern technological evaluation has discovered different chemical cocktails which can also be used through Oxygen facial machines etc. to lighten pigmentation and rejuvenate the skin. Gentler peels are used in our clinic in combination with Lights and Lasers all thought out with scientific clarity. If your Pigmentation is persistent we tell you how to control it and prevent an increase within home protocols. The Dermaroller (also called skin rollers, microneedle rollers, and dermarollers) is a small hand-held rolling device that has micro surgical steel needles that reach the inner surface of your skin to promote skin repair from the inside out. It stimulates elastin and collagen production in the skin without causing any damage and overall appearance of skin improves tremendously. It causes formation of Micro channels through which we induce a transdermal delivery of Lightening and stimulating mediums including vitamins which reduce pigmentation. It can sometimes take up to a few weeks before visible signs of lightening, regeneration and repair are seen and the advantage is that the process will continue over the following months providing you with a natural and long lasting enhancement.